I’m still not through complaining. A tree fell on my neighbor’s house yesterday and it’s left me disturbed. 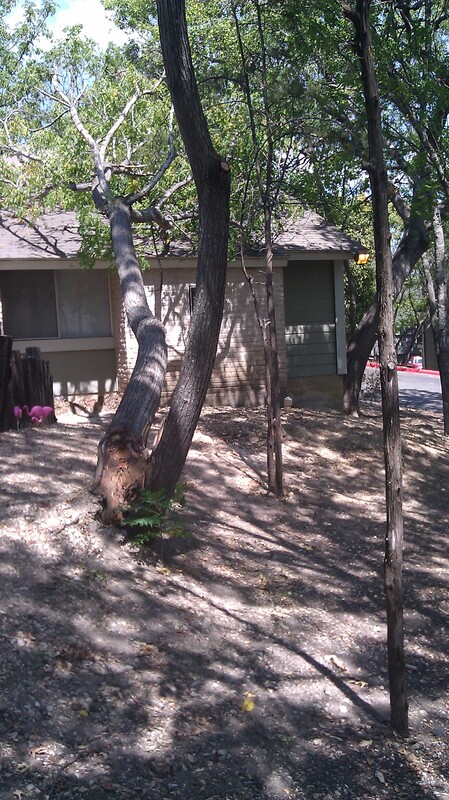 Apparently it’s so dry in Texas that trees are falling down. Dead. Just two days before this incident a waitress told me that they could only give patrons water if they asked for it. Last weekend it was over 110 degrees here. I do live in a post-apocalyptic landscape. Growing up in a sub-tropical climate water was plentiful. There was never a lack of moisture and the only time I ever saw a tree tumble was due to a hurricane. When I was in South Florida recently the rain seemed obscene. It just didn’t seem right for so much water to go wasted. I go through my days in Central Texas with feelings of nausea due to dehydration. I just don’t think I’m cut out to live this dry and hot. Among friends I’m probably known as the person most resistant to living in Texas. This is not due to anything against this state. I think Austin is a great place to live and people here are beyond nice. I am able to attend a world-class university due to the generosity of Texans. Yet this isn’t my home. And on dry, hot days that feeling seems magnified.